LeavenLaw is an AV Rated, Preeminent Law Firm that serves bankruptcy clients throughout the Middle District of Florida, Tampa and Orlando Divisions. 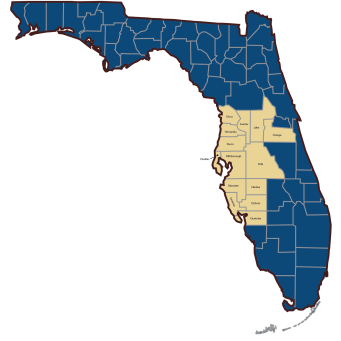 To better help you, the consumer, understand our coverage, we have provided the below list of cities and a map of the counties covering the areas we serve for consumer Bankruptcy representation. If you have any questions, please do not hesitate to contact one of our offices at the numbers listed above. LeavenLaw represents consumers across the State of Florida for creditor harassment (i.e., FDCPA, FCCPA), Fair Credit Reporting Act ("FCRA"), and Telephone Consumer Protection Act ("TCPA") claims or violations. Technology and our ability to represent clients through a sophisticated PACER (Public Access to Court Electronic Records) allows us to be zealous counsel across the State in these consumer-related, contested matters. 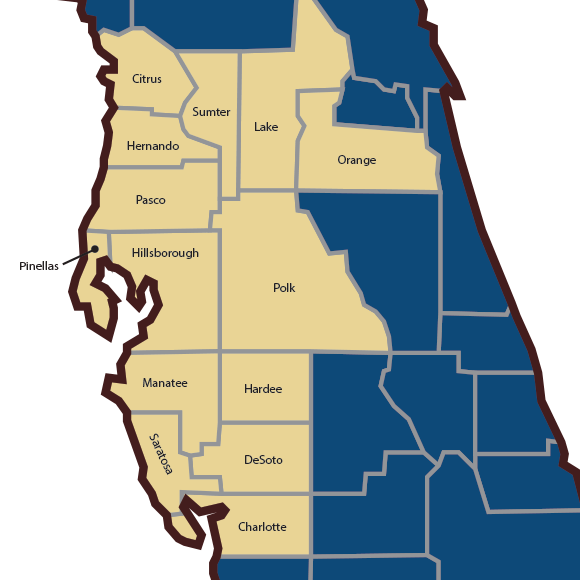 Further, as there is not a nexus requirement to a Trustee (as there is in Bankruptcy related cases) we are not limited in needed to be near either the Tampa or Orlando federal courthouses. As is true with consumer law, as discussed above, the attorneys at LeavenLaw have the ability (and have helped) consumers across the State of Florida in their mortgage foreclosure defense matters. Our extensive experience and knowledge in not only civil litigation, but also consumer law, bankruptcy, title & short sales uniquely positions us to offer comprehensive, accurate counsel to consumers in the toughest financial circumstance. Please call us today for a free initial consultation.